More busy times for us at the Knight house. To start with, Evan had an appointment with the Ear, Nose and Throat doctor last Friday. I’ve been dreading this appointment because Evan does not like his ears messed with. You can kiss them yes, but do not put things inside of them. He is at the point now where he can spot a doctor in a crowd. He does not like doctors. The not so surprising news is that Evan’s ears are still impacted with wax. The doctor was able to remove the wax out of one ear but not the other. I did take a picture of the wax that he pulled out but Lovebug decided it might be too disturbing to post. But if you are anything like me and would like to see my child’s ear wax, just let me know. I’m sure we can arrange something. 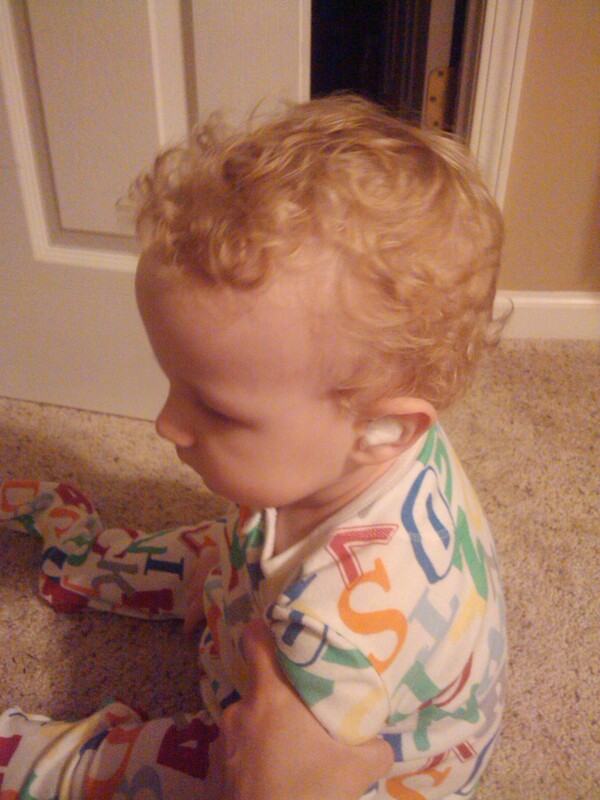 In reference to the other ear, my baby Evan will have to be sedated in order for the doctor to remove the wax build-up. His procedure is scheduled for March. Doc says it’s common and not a big deal, but it is to me. In other news, my sweet baby brother Seth, turned 6. I keep telling him that he is not allowed to be 6 years old and that he needs to let me hold him like a baby. He then quickly decides he doesn’t like this idea and runs from me. 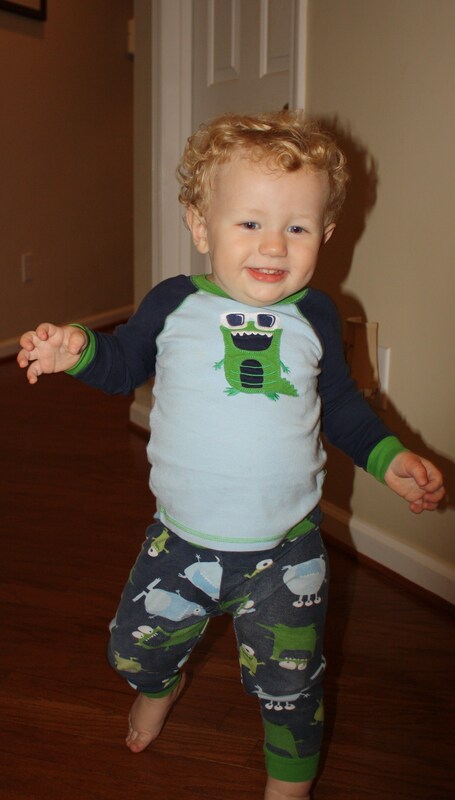 Evan is walking! It’s a miracle. I thought this kid would never walk. He is so funny walking that I get a chuckle every time he takes off. He still falls down a lot but he gets right back up and keeps on keeping on. We walk down the hall. We walk and give funny looks. 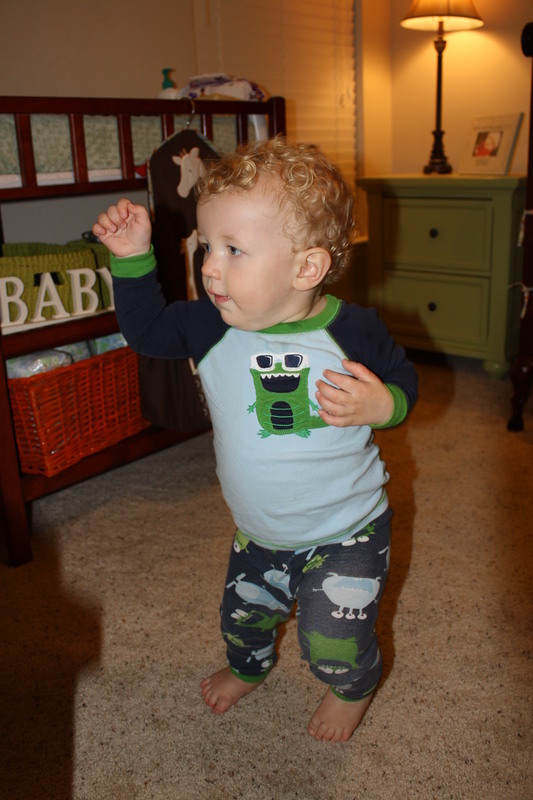 Then we go upstairs to his room and DANCE! The Macarena is our favorite! 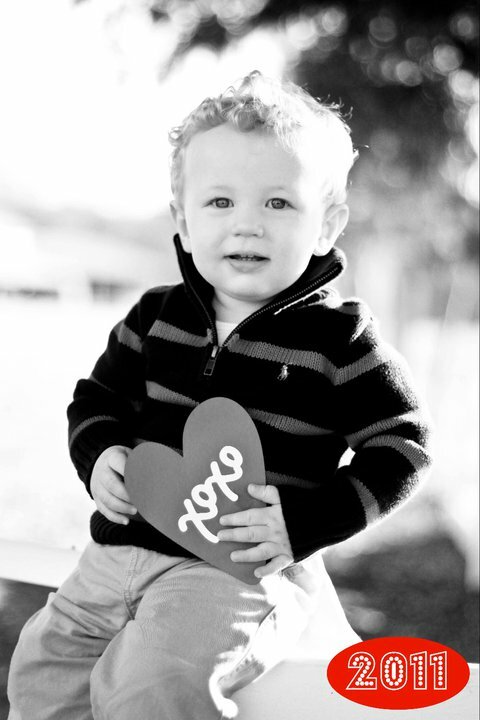 These were a few of Chunk’s Valentine’s Day photos that my BFF took. All I can say is that she is absolutely the best. I came across an incredible deal at Walgreen’s and was able to order a few photo cards. My total bill was only $4.51. I wasn’t quite sure how they were going to turn out considering the bargain price I paid for them. I ordered 15 photo cards which came to $2.00 and the other $2.51 was for tax and shipping. So, for under $5.00 I got 15 4 x 6 cards which I am pleasantly happy with. I like it a lot because it was simple and reasonable. 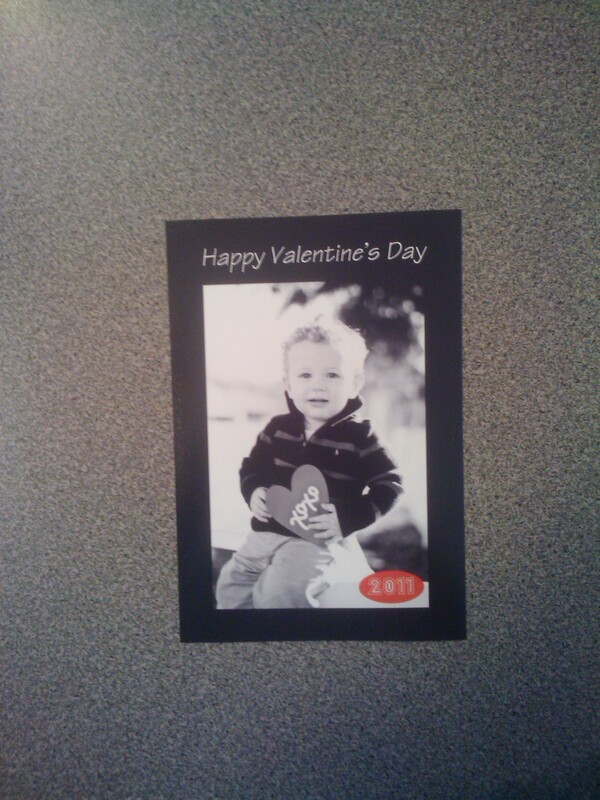 This all started when I got an email from Walgreen’s about a week before Valentine’s Day offering 40% off photo prints. If you know me you know how much I love getting deals, so I had no choice but to order something. Nothing shows greater love than a photo of Evan. Well, that’s what I believe anyway. Hope everyone had a happy Valentine’s Day! On the 8th day of February my baby turned 14 months. Just look at those lips. Don’t you want to just kiss them? I do about a gazillion times a day! 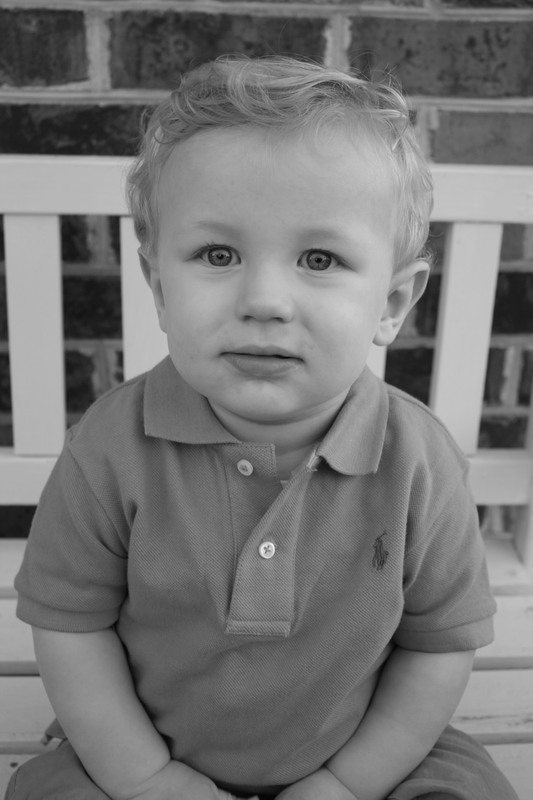 This little boy is really getting a personality of his own. I’m discovering the little person he is turning into is oddly familiar to someone I know. Really well. And it’s not me. 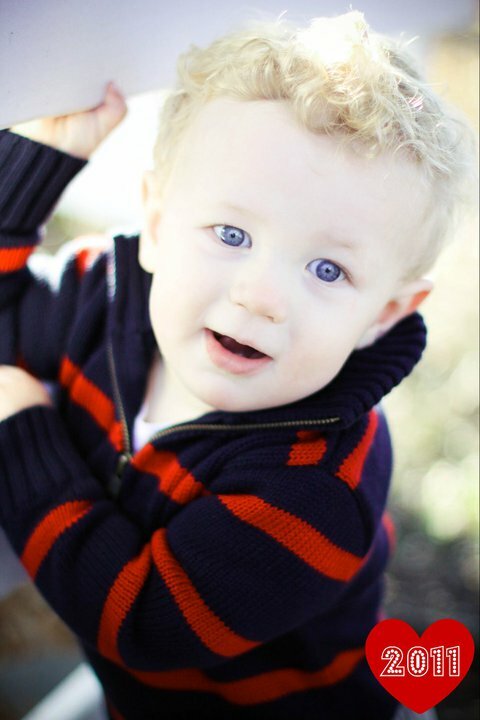 He has Lovebug’s sense of humor and will laugh at practically anything. Anytime we go out to eat, he will stare and check people out. I find myself telling him to stop staring, but then realize he has no clue about what I’m saying. Also, when playing with any toy that makes a sound or loud noise, he will push the same button over and over again, long enough to make me want to scream and if we’re in the car, almost cause me to wreck. Again, this is oddly familiar because Lovebug does the same thing with any toy, gizmo or gadget. On very rare occasions I see me. He loves candy like I do and will choose dessert over dinner anytime. He can’t pass by a mirror without checking himself out. We just cant help but stop and make a funny face or a smirky grin. It gets us every time. Let me show you these lips again. Evan can be the most lovable thing ever. He will drench your face with juicy saliva from all the open mouth kisses. He loves giving hugs and will even pat you on the back while hugging. On other days, he reminds us that he is a big boy now and thinks he doesn’t need a nap, or an 8 pm bed time. He knows the rocking chair means bed time and will squirm down and crawl the other way. Speaking of crawling, this little booger still isn’t walking. Although he has surprised us over the past week and has become quite braver. His balance just still is not there. I think it’s his rather large head and upper body that throws him off. 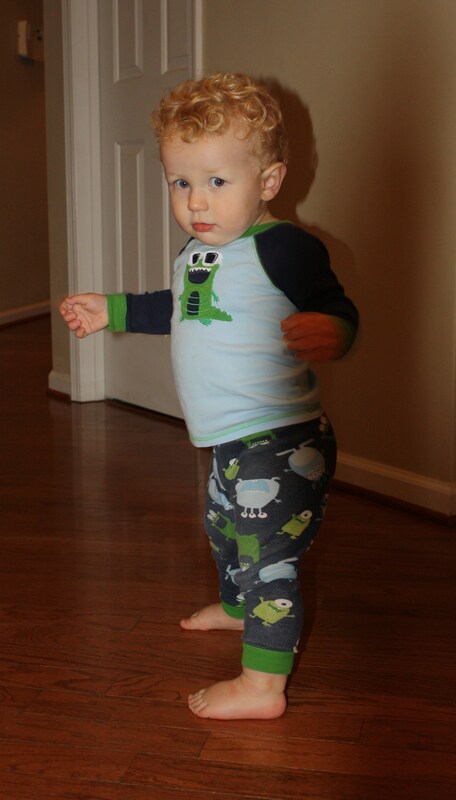 I keep saying any day now he will walk, but have come to realize that I’ve been saying that since he was about 10 months old. Every parent will tell you that their baby is advanced, even when maybe they’re really not. We are no different. Evan got “Baby Can Read” for Christmas and he really is catching on to the words. In no time he was reading. Okay, maybe that last sentence was not entirely true. He’s not actually reading but has learned some new tricks. 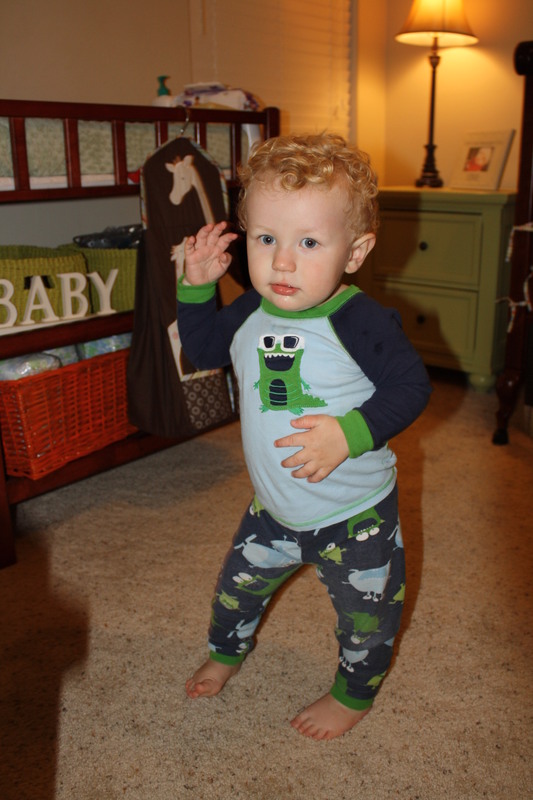 His favorites are “arms up”, “clap”, and “ear”. Other moms have asked me about “Baby Can Read” and I can tell you that Evan has learned almost all the words in volume 1. He is not necessarily reading but if you show him the picture on the flash card he can express what it means. 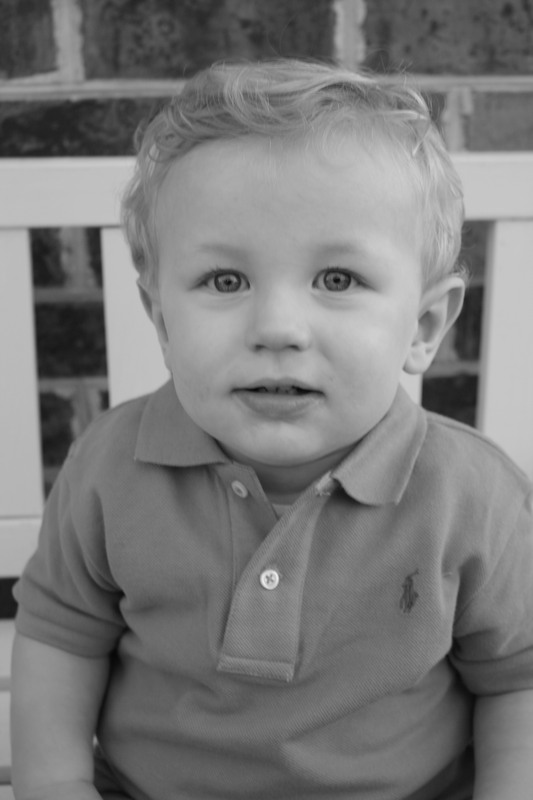 Evan amazes us everyday and we graciously thank the Lord for blessing us with a son that we do not deserve. Look at the drumsticks on this boy! Oh how I love him so. We’ve been busy, busy, busy and more busy. And it hasn’t all been good. Evan was sick again last week so we took another trip to our Pediatrician. We have to be careful because anytime Evan gets sick he always ends up getting a really bad cough. And that is not good, because Chunks is very asthmatic, just like his father was when he was little. After giving him four breathing treatments a day for three days, it was time to head back to the doctor. 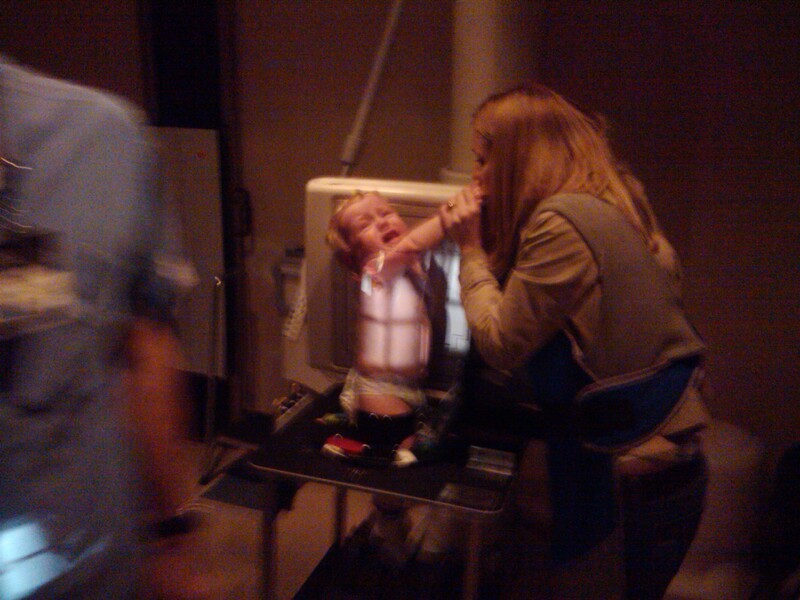 The Pediatrician was concerned about his lungs and wanted to make sure Pneumonia hadn’t set in, so he sent us over to the hospital for x-rays. Warning: Very disturbing photos of what they did to my child. 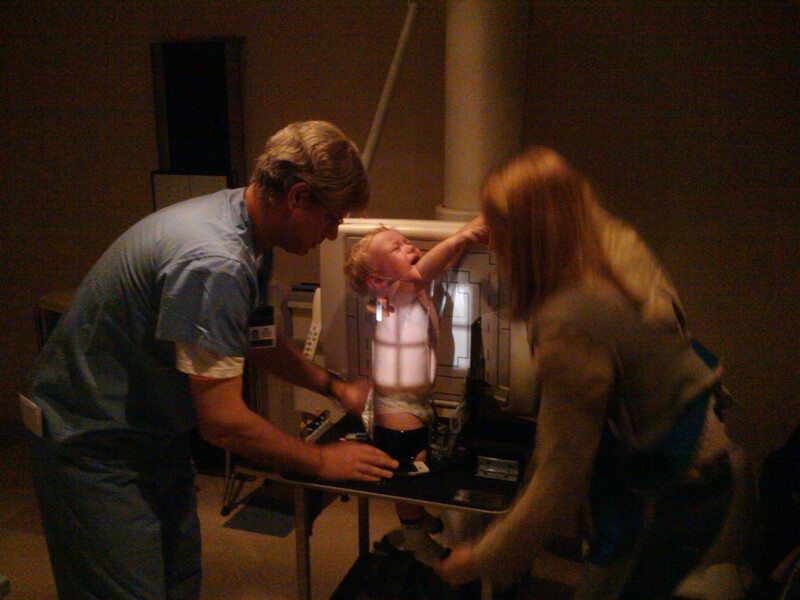 This whole x-ray process was very traumatic for Evan and I. First off, Evan was squeezed into a horrible looking plastic Medieval torture device. Second, he didn’t quite fit. Third, Lovebug was laughing at us while taking pictures with my phone. I tried everything to calm him down. Notice me trying to tickle his feet in the last photo. Needless to say, that didn’t work either. The good news is Evan doesn’t have Pneumonia. The bad news is that we both need therapy from this experience. The doctor put Evan on some antibiotics and also informed us that he had an extremely large build up of wax in both ears. Ever since he was little, Chunks has been a waxy thing. You should see the wax I get out of this boy’s ears! And just to clarify, I do clean his ears out every night after we get out of the bath tub. I just don’t understand how he can be so waxy. I was so shocked when the doc said this. So off we went from the doc’s office with a prescription for ear drops and were informed that if these didn’t work, Evan would have to see an Ear, Nose and Throat doctor. 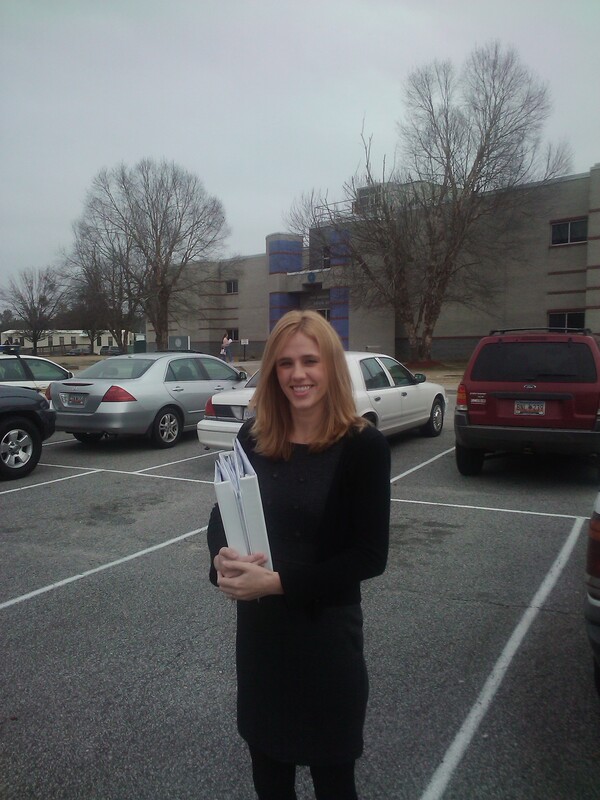 After dealing with a sickness, we had to deal with a civil lawsuit. First reason: They will trash your house. Second reason: You will have to put a civil judgement against them. Third reason: You will have a court date. Fourth reason: Upon this court date, you will have to look intelligent and act like you know what you are doing. Honestly, does it look like this person knows what she is doing? And would you take her serious? The good news is their attorney decided to settle with us right before court. Hopefully my courtroom days are over, but if I find myself back inside one, God help the person sitting in the Defendant’s chair.